Colette Bangert, 83, works on a new fiber piece in her attic studio in Lawrence, Kan.
Colette and Jeff Bangert were early innovators in computer-based art, starting in the 1960s. Their "algorithmic" drawings have an international following, and they're in collections of museums such as the Victoria and Albert Museum in London, England, and the Spencer Museum of Art on the campus of the University of Kansas in Lawrence, Kansas. Colette now works mostly in fiber and watercolor, but she still spends each morning on her art. Documenting each work is an important part of Bangert's artistic process. These days though, at 83, a trip up to her attic studio in Lawrence leaves her a little winded. At the top of the stairs, stacks of finished watercolors sit on shelves. Bangert says sometimes she worries what will happen to it when she's gone. But she says she wants to spend her time creating, not fretting. Bangert looks through early work at a light table. Less than a mile away from the Bangerts' home, at the Spencer Museum of Art, director Saralyn Reece Hardy pulls open a drawer to show an ink on paper work by the Bangerts. “Vertical Landscape” from 1970 is part of the Spencer’s permanent collection. "For Colette, a plains landscape in abstraction is not one that you’d see on a picture postcard. It’s more like being inside a place," says Hardy. "She's one of those somewhat rare, but intriguing artists who has had an international impact, but also is a vibrant regional force." The Spencer Museum re-opened in October after an $8 million renovation. It's now filled with light, and most of the collection — 40,000 pieces — is on view. Hardy says collecting regional artists is part of the museum’s mission, but there are some limitations. “Artists need to have a home in museums somehow and of course we can’t collect everyone and we can’t collect everyone in depth but we can begin to intertwine the archive with the creative impulse,” says Hardy. Spencer Museum of Art at the University of Kansas Museum Director Saralyn Reece Hardy (from left) and Associate Director and Senior Curator of Works on Paper Stephen Goddard look at works in their permanent collection by Jeff and Colette Bangert. Handling collections of artwork is not only a role for large, public institutions. It's often an unexpected one for family and friends of artists. In 2015, artist Douglas Schwietert died of an aggressive form of cancer. He was only 55. Longtime friend and fellow artist Lori Raye Erickson stepped in to help catalog his work. 'Sickbed' by artist Douglas Schwietert. Nicole Cawlfield, photographer and photo stylist, checks a test image on her computer while documenting a painting by Schwietert. Since Schwietert’s death, she and several friends have been gathering at the Hobbs Building in the West Bottoms in Kansas City, Missouri. They’re photographing the hundreds of paintings and assemblages he left behind. The process can be overwhelming, but, for Erickson, it’s also a way to memorialize him. Longtime friend and fellow artist Lori Raye Erickson makes notes on a Schwietert piece during a long day of photographing. Erickson says, even after spending so much time with Schwietert’s art, she still struggles with documenting her own. “I do have a tendency to make pieces and someone wants it and I sell it before I document it,” she says with a laugh. “Doug did that too, so it’s something I need to work on." 'Disengagement' by artist Douglas Schwietert. That tension between creation and preservation has been at the forefront of Stephanie Leedy’s mind. 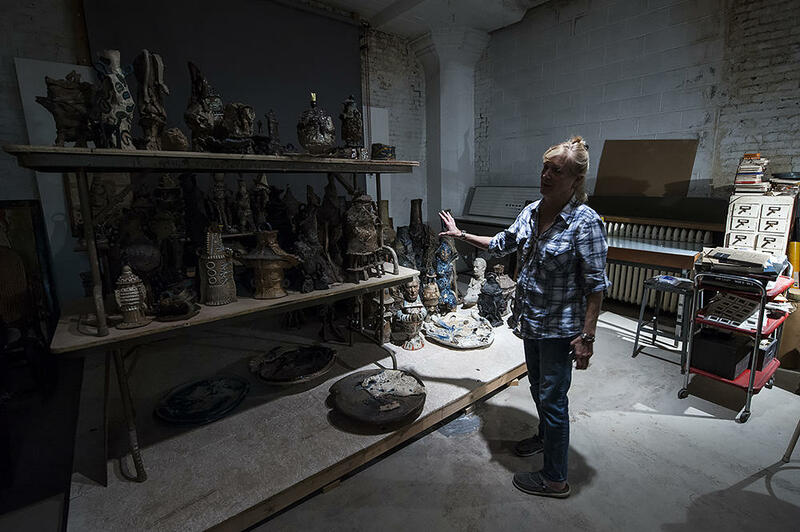 On a recent weekday, she walked to unlock the door of a storage space above the Leedy-Voulkos Art Center, a gallery founded by her father at 20th and Baltimore in the Crossroads Arts District in Kansas City. Jim Leedy, who's now 85, taught at the Kansas City Art Institute for more than 40 years. His work, stored here, spans a lifetime and several mediums: clay, painting and installation. Family conversations led to an idea to establish the Leedy Foundation to safeguard his legacy. Stephanie Leedy envisions the foundation as a way to keep her dad’s work visible in the heart of the arts district he pioneered: the Crossroads. “A place for his work to live and carry on and continue to give and that’s really where it started is trying to figure out what to do with this abundance of work," Leedy says. Surrounded by her father Jim Leedy's artwork, Stephanie Leedy looks to preserving his legacy through a new foundation. Stephanie Leedy has become a resource for Kansas City artists — and their family members — who are also wondering how to store and preserve artwork. She hopes the foundation, once it’s up and running, will conserve her dad’s work — and possibly that of generations of Kansas City artists. Artists’ File Initiative, Spencer Art Reference Library, The Nelson-Atkins Museum of Art in Kansas City, Mo. : a database project with archival files documenting the careers of artists in the Kansas City area. Estate Planning Workbook: The Joan Mitchell Foundation is committed to preparing artists – as well as their families, loved ones, and supporters – for the business of organizing and protecting their legacy. Creating a Living Legacy: An initiative of the Joan Mitchell Foundation designed to provide support to older artists in the areas of studio organization, archiving, inventory management, and through this work create a comprehensive and usable documentation of their artworks and careers. The Art Connection: The Art Connection’s art donation and placement program connects artists and collectors who want to donate artwork knowing that it will have an impact on those who access services at the recipient agencies. GYST-Ink: An artist-run company providing resources, technology and solutions created by artists for artists. The company says its mission is to support arts professionals, educational institutions, and arts organizations with an integrated program of software, services and information to keep artists working. Tree of Life: An organization, based in Winston-Salem, N.C., that provides grants for senior visual artists to preserve and document their work. 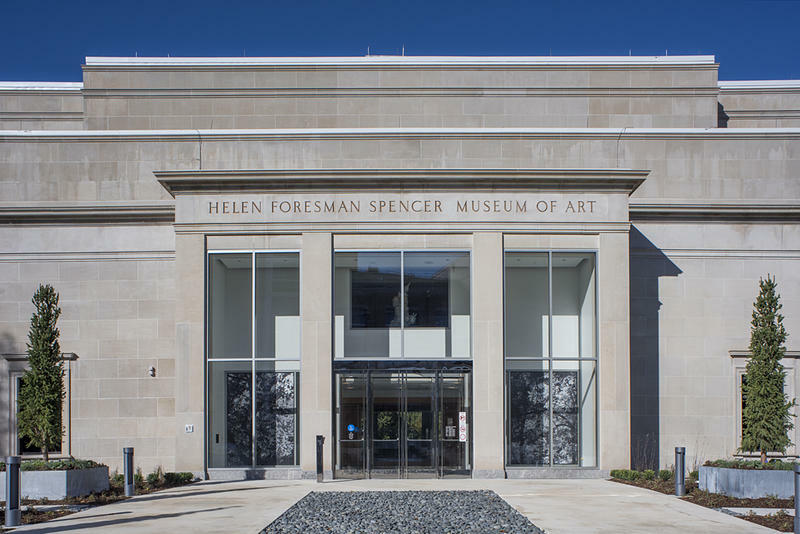 Visitors to the Spencer Museum of Art in Lawrence will soon see it in a new light – specifically, light pouring into a brand new, glass-encased entryway that is part of an $8 million renovation. After 18 months, the museum celebrates a grand re-opening on Saturday, but because they are the museum’s primary patrons, students at the University of Kansas got a special preview party on October 6. Even if they just came for the free food — always a draw for students — the museum’s transformation didn’t disappoint. This profile is part of KCUR’s occasional series, Aging in Place. We’re showcasing the many different faces of 64 in metro Kansas City.